Mad Dog BBQ sauces are the creation of David Ashley (Ashley Foods). 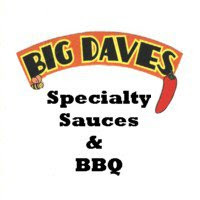 David's company is one of the most respected names in the fiery foods industry. In addition to BBQ sauce, Ashley Foods produces an extensive line of hot sauces. David is the brains behind some of the hottest, most popular sauces in the world. I previously reviewed Mad Dog Chipotle BBQ and recently had the chance to try their original recipe. Like the Chipotle sauce, Mad Dog Original BBQ is a dark, full bodied sauce. The sauce is fairly thick and pours smooth, but slowly. This tomato based sauce has a slight brown sugar sweetness, but it's balanced with smokey, earthy spices. Mad Dog's bold flavor may be too much for some, but Ashley Foods doesn't make products for the timid. The sauce has a medium heat level (substantially less than the Chipotle version) that sneaks up on you at the finish. I used this sauce on grilled chicken and pulled pork. It worked well as a finishing sauce for the chicken. The flavors matured nicely when the fire was applied. The sugars caramelized well adding great color and flavor to the chicken. The sauce also worked well on the pork. It was especially nice when used in tandem on a sandwich with creamy coleslaw. Mad Dog hot sauces have an unsurpassed reputation for quality. Their line of BBQ sauces is garnering similar attention. While I enjoyed their Chipotle BBQ Sauce, I believe I like Mad Dog Original even more. For those looking for a rich, bold flavored sauce, Mad Dog is a top shelf option. To learn more about Ashley Foods and the entire Mad Dog line, Click here. See how Mad Dog Original rates on our "Product Reviews" page. 0 Response to "Mad Dog Original BBQ Sauce"